One long lasting, the other not! Sit back and sip on a quality glass of Ninth Island Pinot Noir whilst enjoying your new floral decor. 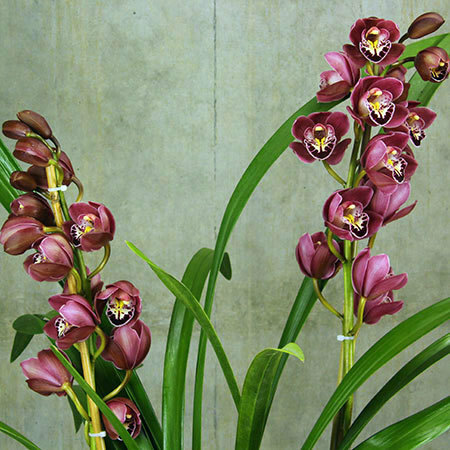 Cymbidium orchid plants are ideal for indoors during the cooler months, and can be potted or planted in the garden after they have flowered. Beautifullly preented and available in a variety of colours (we love the burgundy flower teamed with the pinot! ), you can order these fabulous all-occassion gifts online, emailing directly to sales@flowersforeveryone.com.au or by calling the team on 1800 66 66 46. 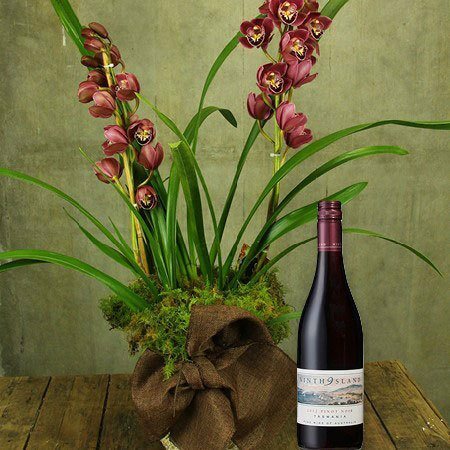 *Please note: The pictured orchid plant and wine is exclusive to Sydney metro flower delivery only. Colour preferences may vary depending on availability. Would you like to send flowers, plants and gifts outside the Sydney metro? Give us a call on 1800 66 66 46 or email our sales consultants at sales@flowersforeveryone.com.au. Our team can make suggestions appropriate to your specific delivery location and seasonal availability of flowers. Flower deliveries outside the Sydney metro are placed via an affiliate florist network. 2015-07-22 The chosen Orchid is a wonderfully large plant perfect for its position and delighted the recipient ( as did the bottle of wine). A fine gift.